"He was intent that this was his ride out of there." An old horse was at a "kill lot" in Texas when he realized he would simply have to save his own life. So when he spotted a group of people who were there to rescue some mini donkeys in the same life-threatening predicament, he decided to go with them. 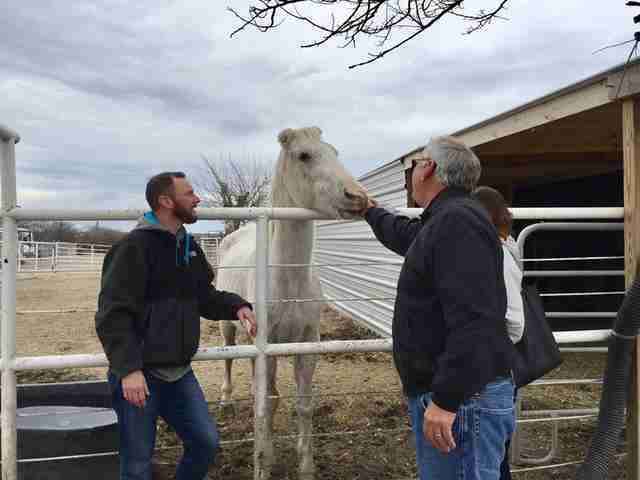 "This skinny, grey gelding walked straight up to our trailer, past the gates, disregarding the commands of the kill lot employees," Becky's Hope Horse Rescue in Frisco, Texas, wrote earlier this month. "He was intent that this was his ride out of there." 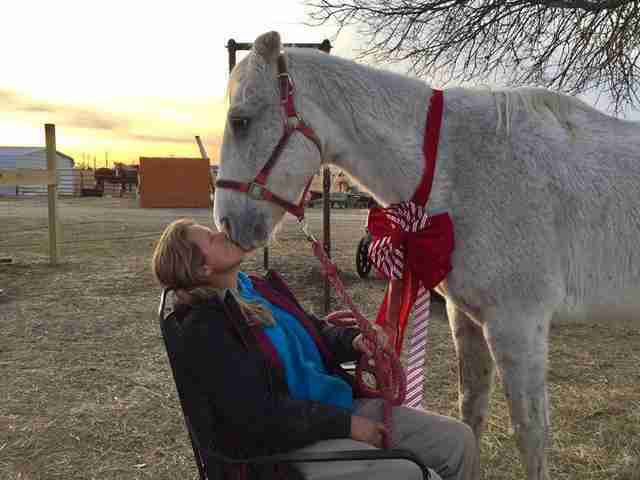 Sarah McGregor, a spokesperson for Becky's Hope, explained that the "kill lot" in North Texas where the horse, named Bubbles, comes from is the last place animals get a chance to be rescued before heading to Mexico for slaughter. "Oftentimes, the horses or donkeys are old, or the owners lost their property, or the owners passed away or simply are unable to care for them and they are sold to auction," McGregor told The Dodo. "If they are not bought at auction by people or other farms, the slaughter pipeline will buy up all of the animals and resell them." This was very nearly Bubbles's fate - before he decided to adopt his own rescuers. 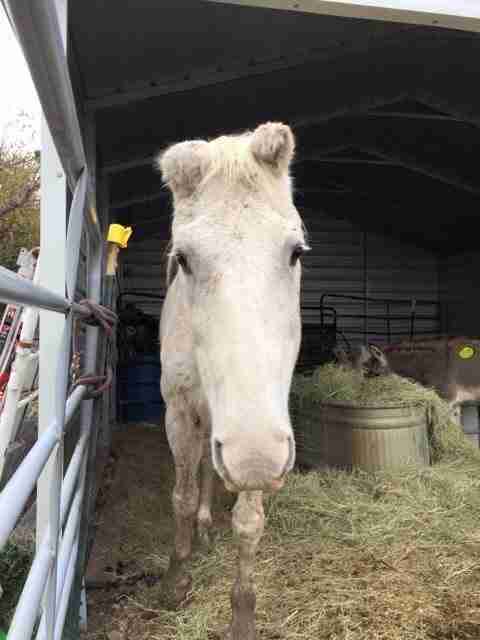 "We stood there staring as this old guy with crumbled ears from frostbite waited patiently for the group of mini donkeys to catch up so he could jump on the 'freedom trailer' out of there," the rescue wrote. "There was just no way we could leave him behind!" Luckily, the rescuers had just enough money from donations to Becky's Hope to rescue this old guy - so they did. "This sweet, old man won our hearts the minute he decided it was the perfect time to escape the kill lot," the rescue wrote. "It seems that he thought nobody would notice him escaping if he simply mixed in with the mini donkeys!" Now he's safe and happy at Becky's Hope, meeting people who want to stroke the nose of the horse who rescued himself. "He is adjusting so well as if he knew that this rescue was where he belonged all along," McGregor said. 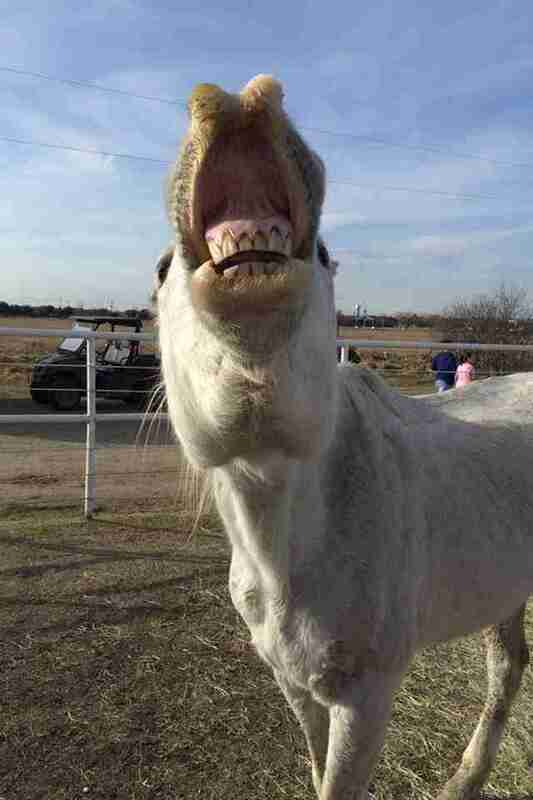 "He loves attention, loves grazing and getting special treats." But Bubbles is, sadly, an exceptional case. "We try and get as many as we can with the funds we raise. However, we simply cannot get all of them," McGregor said. "Many of our animals are from the kill pen. Many moms with unborn babies and even moms with their new babies. It's a devastating scene. However, we are so fortunate that we can save some." To learn what you can do to help Bubbles and the other animals at Becky's Hope Horse Rescue, click here.